Every year in the Summer semester, the Department of Art History, Film and Visual Studies puts on a colloquium in conjunction with the Journal of Art Historiography, which is affiliated with the Department. This year’s colloquium, which is taking place on the 7th and 8th May 2014, will address the relationships that exist between, on the one hand, academic art historians and, on the other, museum professionals, and aims to consider how art history as a discipline affects curatorial practices, and vice versa, how curatorial practices can affect art history. In particular the colloquium seeks to explore how innovative museum and gallery curating can impact on the kinds of objects that are usually deemed to fall under the remit of art history and, on the flip-side, what is usually excluded. Can innovative curatorial practices break down the conventional boundaries that have been thought to exist between “fine art” and “material culture”, for example? The colloquium is being organised by postgraduate students from the Department of Art History, Film and Visual Studies and Dr. Camilla Smith, and there is still time to submit proposals for papers for consideration. The deadline for receipt of abstracts for papers of 300 words is Thursday 19th December 2013. 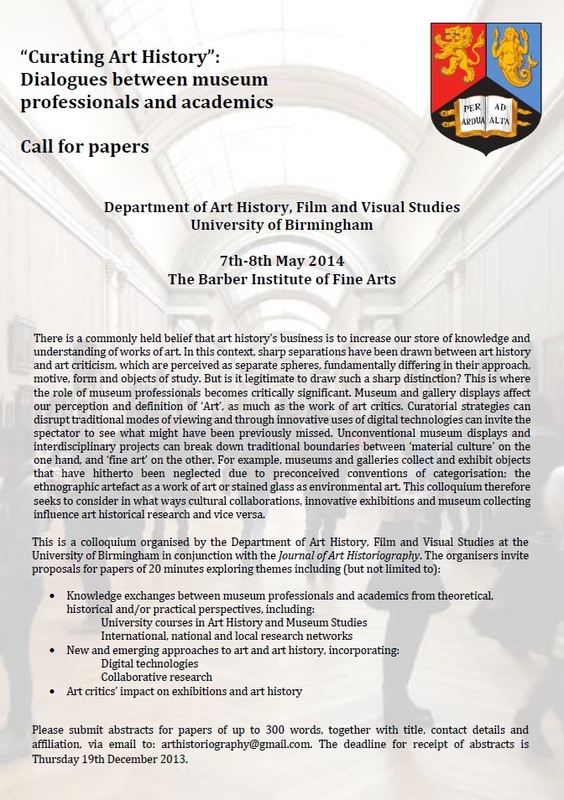 Abstracts should include title, contact details and affiliation and be sent by email to arthistoriography@gmail.com.